You can see the speaker behind the flowers if you look really closely, but I think it does the trick. So, a little touch of spring for the front~I'm thinking I could change it up for the seasons as well. For right now, I'm hooked on the daisies. Oh, and P.S.~ Wendy, I used your idea with the food coloring at the bottom of the cereal on April Fools. When we added the milk, the kids thought I was magic making the color suddenly appear like that. Loved it~thanks!! What a charming display beside your front door. Great solution. Seriously I L.O.V.E. it!! You did such a great job and for a bargain as well. I love crafts that are low budget but look completely fabulous!! That was a great idea and it looks great. This is such a cute idea. You did so good covering up the speaker. I love the daisies! 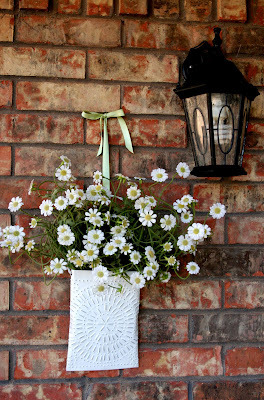 What a great way to make your entry welcoming and spring-y! 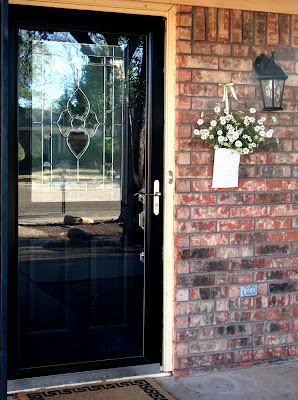 I just wanted to let you know that I loved your front door so much that I used it in my own "hooked on" post (with credit, of course). :) Thanks for the inspiration! beautiful...I even love the little ribbon you hung it with! Leave to you and you can figure out what to do...love the idea you came up with Melissa! What a great idea! I would never guess that eyesore is lurking behind those daisies. It looks so happy! That is a great cover up! I love the daises. I'm glad it worked out well for you. YOu should have seen my daughter's face! She was NOT impressed, lol. I put a picture of her reaction on my blog. WHat a great, pretty and creative solution! Those daisies are so pretty! I love it!!!! Looks sooo much better than the hideous speaker box. Susan would be proud. I want to make me one now! I luv your creativity!!! You can't see the speakers!! Good for you, no eye sore, and it is so pretty! 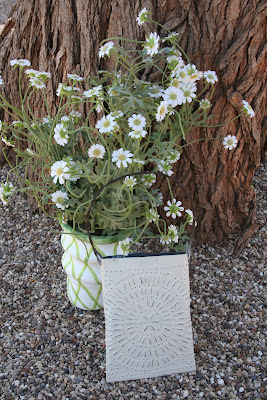 The perfect solution, and I love the daisies. Thanks for sharing. Your arrangement worked out so well. Very nice. Big improvement! I think that's the perfect use for the tin holder. What a great way to cover that up! Fantastic idea! Your blog is beautiful and I love the ideas you share. I also love making a home more "cozy". It is so pretty! As my daughter would say it's "fantabulous"! Creative AND lovely, as usual. Thanks for sharing. This is so fabulous! 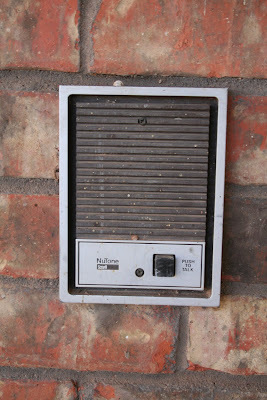 We have a doorbell that hasn't worked for like 10 years. I am totally using this idea! !